From designing the Y on the mountain to laying the foundations of stereophonic sound, Harvey Fletcher used his intellect to serve and discover. It was the late 1920s and Harvey Fletcher (BS 1907), a research physicist and leading authority in sound, had an idea. He had attended a meeting of an organization for the hard of hearing, and he thought it would help the participants—many of them hearing impaired—if he could design a group hearing system. At the time, individual hearing aids were large and not easily portable. He persuaded Bell Telephone Laboratories to donate parts and assemble about 100 headsets that would be connected to an amplifier. The convention room at the Astor Hotel in New York was silent as Fletcher explained the device. After those who could hear helped others adjust their headsets, he began speaking in a normal voice. Tears ran down cheeks as audience members declared, “I can hear! I can hear!” This was the first time many of them had heard a public speech. Fletcher is known as the father of stereophonic sound, and whether you are watching a movie or listening to multi-track sound, Fletcher’s hand was in it. Sound was his passion. Harvey Fletcher will be the university’s honored founder during Homecoming 2010; the theme, Dare to Discover, reflects his life and achievements. Harvey Fletcher’s study of acoustics led to many innovations, and he continued learning and teaching about his field throughout his life. The Provo native was a man of many firsts. 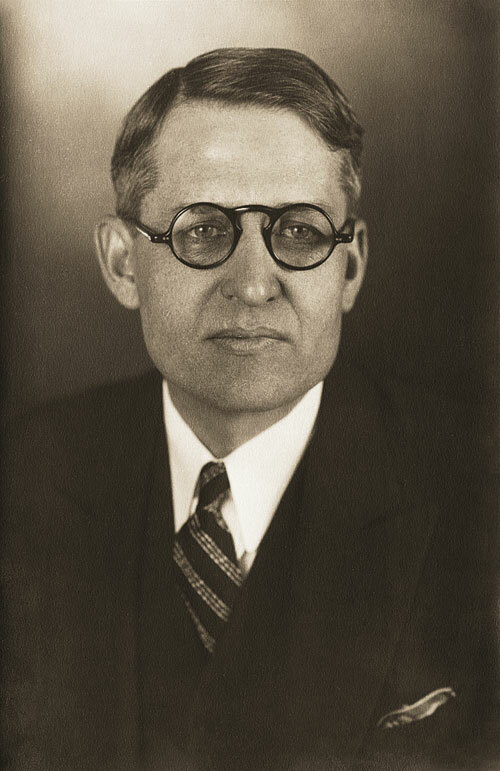 He was the first physics student to be given highest honors at the University of Chicago, where he earned his doctorate. He was the first member of The Church of Jesus Christ of Latter-day Saints to be elected to the National Academy of Science. He was the first president of the Acoustical Society of America. He was also the first to introduce a group audiometer into a school classroom, launching a national program for testing children’s hearing. While a student at BYU, Fletcher was part of a team charged with calculating the dimensions of a giant letter Y the school wanted to create on a nearby mountainside. Their success in factoring in slope, distance, and perspective to avoid a distorted letter is still apparent to all campus visitors. 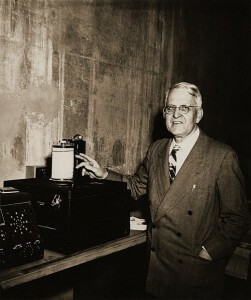 In Chicago Fletcher completed his doctoral work under Robert A. Millikan, contributing to experiments to measure the charge of an electron—work that eventually earned Millikan a Nobel Prize. A fter receiving his doctorate, Fletcher spent five years as a BYU physics professor before accepting a job with what would become Bell Labs. Church President Joseph F. Smith urged him to take the position, saying, “Keep your testimony strong and keep up your church activities. If you do so, you can do more good for the Church in New York than you could do here at the BYU at the present time and you will be successful in your work. We need more Mormon boys to go out into the world of business and scientific research to represent our ideal of living.” Fletcher accepted the prophet’s charge; the Church remained a vital part of his life, and he served in many leadership positions. When he turned 65 Fletcher left Bell Labs and spent two years at Columbia University. He returned to BYU in 1952 and became director of research and the first dean of the College of Physical and Engineering Sciences. Fletcher continued his work in acoustics until his death in 1981 at age 97.